On Saturday night the Don Haskins Center in El Paso, Texas will be the host site for Top Rank Promotions latest offering on the streaming network, ESPN+. 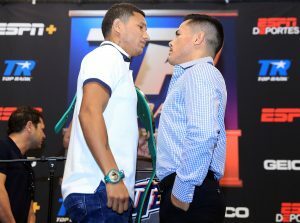 WBC Junior Lightweight Champion Miguel Berchelt will defend his title against Miguel “Mickey” Roman in a fight that most think will be an action packed bout. The co-main event of the evening will be between Miguel Marriaga and Jose Estrella in the featherweight division. Other boxers on the undercard include Saul Rodriguez, Robson Conceicao, Sagadat Rakhmankul, Jose Estrella, Claudio Tapia, Joey Laviolette, and Vaughn Alexander. The following is a preview of the main event of the evening. Berchelt should be considered by many to be a strong favorite. He only has one loss while Roman has twelve, and he’s six years younger than Roman. He will also have about a two inch height advantage and about a four and a half inch reach advantage. Both boxers have good power. Berchelt has stopped thirty of his opponents while Roman has stopped forty seven. Berchelt has been stopped once early in his career while Roman has only been stopped twice. Berchelt and Roman are both pretty active. Roman already has over 72 professional fights. He fought twice in 2018, three times in 2017, and three times in 2016. Berchelt fought twice in 2018, twice in 2017, and twice in 2016. Berchelt has an edge in amateur experience. He’s a three time Mexican National Boxing Champion in the elite category while Roman doesn’t have any notable amateur accomplishments. Berchelt lone loss was to Luis Eduardo Florez. He has defeated the likes of Jonathan Victor Barros, Maxwell Awuku, Takashi Miura, Francisco Vargas, Suriya Tatakhun, and Rene Gonzalez. Roman has defeated the likes of Michel Marcano, Orlando Salido, Nery Saguilan, Juli Giner, and Daniel Ponce DeLeon. His wins against Orlando Salido and Daniel Ponce DeLeon are his most impressive and occurred recently. However, Roman has a history of losing when he steps up in competition, and he does have a large number of losses. He has losses to Genaro Garcia, Jorge Solis, Miguel Beltran Jr., Antonio Escalante, Jonathan Victor Barros, Javier Fortuna, Antonio DeMarco, Dante Jardon (lost the rematch), and Takashi Miura. Roman is a dangerous opponent for Berchelt in that he’s an experience rugged fighter who has already been in the ring with some of the best. But Berchelt is a top rated prospects with a high ceiling, and he’ll have a significant size advantage and age advantage on Saturday night. This fight will feature some fireworks, but at the end Berchelt will likely be holding his hand up high.